& even threw in a bunch of CASH, but for some odd reason, she seemed less than enthusiastic about it. Wood is usually considered the traditional 5 year anniversary gift.. Given that the 'card' came from wood, a slice of beautiful cherry, might have been better. Some consider 'silverware' as the gift of choice. Therefore, to replace the paper money with ; silver coin, might have been a choice. In any case congratulations, on making it to 5 years. this was of course, a gag gift to start the day off with. We've both laughed our butts off over it ever since. Great, now that you went and raised the bar, we will ALL have to add 5 bucks to our DIY cards! Congrats on getting there, many don't. Its 45 years of enslavement for me this October 4th. No, it's worse than that, Brad. It has to be a dollar FOR EACH YEAR! LMBO! 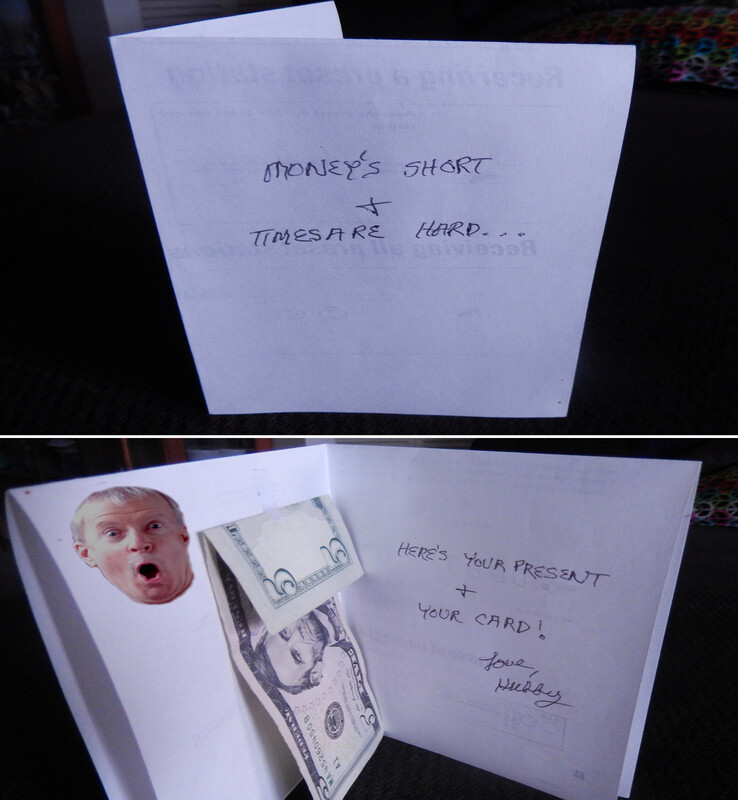 and, of course, a very nice, REAL anniversary card! Not nearly enough, considering the quality of her character! I would venture to say MOST don't. Guess who's Brownie Points jar must be pretty full now? My first was 13 years (unlucky number, there) and I'm in the 37th year on the second. My Brownie Points jar is pretty empty though. Been hanging here with you for 9 years. Still making me laugh.